Here is a little about why I homeschool. I have been homeschooling for about 20 years. When I had my first child I knew that I did not want to send her to public school. I wanted my child to be taught a Christian world view. 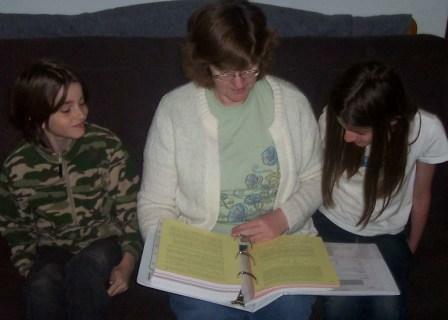 We could not afford to send her to a Christian school so I research homeschooling. I did a lot of reading. When she was 3 she wanted to be homeschooled. I started but it did not go well. I read The Moore books about taking a relaxed approach to homeschooling, so I put off formal schooling for several years. We still did a lot. We did art projects and learned about our world. I continued homeschooling and had three more children. All of my children struggle with learning to some extent. I was not the success story that you hear so much about. When I started my website I wanted other families that struggle to know that they are not alone. I wanted to provide tips on dealing with difficult situations. Recently I had to go through another difficult situation. My husband and I decided for financial reasons that I needed to go back to work. I liked to teach so I decided to work in the public schools. I became an aid in the special education department. I mainly worked with children who were autistic. I also had some experience with children who struggled with math and reading. I wanted to be good at my job with the school district so I went back to school(I also have a BA in psycology) I took classes on how to teach math, science, and language arts. I also had classes in teaching children with special needs. I liked my job teaching the children but I really wanted to stay home with my children. I missed all of the extras that we did such as art and cooking. I missed not being able to go on field trips when everyone else was at work or in school. One day I was searching the web. I can found a website that I like. She talked about how Solo Build It helped her make a web business. I thought that I could do that, so I contacted Solo Build It. I started a website. For me it is more than a business the website is a way that I can help people.